We are a leading Manufacturer of six panel interior door from Coimbatore, India. 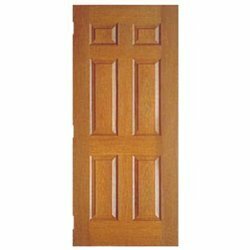 Six Panel Interior Door offered are well recognized in the market for providing desired door durability, strength as well as protection from issues like corrosion, rotting and other issues. As these doors are constructed using superior grade FRP material, these feature zero maintenance as well as excellent resistance to moisture/water. Further, these are also resistant to electrical shocks as well as have no effect of temperature/heat on them. These are also resistant to water hammering and can be made available in primed finish so as to make these ready to paint to match the home decor. The doors also feature look and feel of solid wood and feature 6-Panel design with solid stile and rail construction. Looking for Interior Six Panel Doors ?